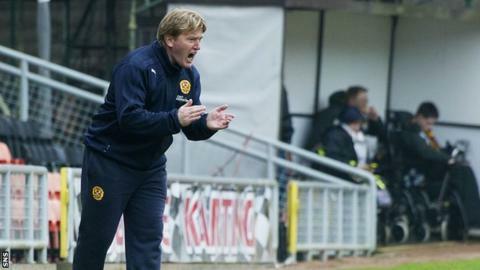 Stuart McCall suggested Motherwell were outdone in every position in their 5-1 defeat by Dundee United on their third league trip to Tannadice this season. "We were very, very poor; United were very, very good. They have had the measure of us this season," said the manager of third-placed Well. "Every player in their side today was better than ours. "Today was a very poor performance and I can only apologise to our supporters, but come next Saturday we'll be ready." United beat Motherwell 4-0 at Fir Park in November in the Scottish Premiership. The quirks of the split after 33 matches meant the Steelmen had to travel to Tannadice for a third time following a 2-2 draw there in September and a 3-1 defeat in February. And they were ripped apart by Nadir Ciftci's first-half double, which was added to after the interval by Stuart Armstrong, Ryan Dow and Brian Graham. Lionel Ainsworth scored late in the game for the visitors. "The first three goals were all breakaways," lamented McCall. "They have great pace in their side. "The one silver lining is that we have three games left and we don't win 19 games out of 35 by being a poor side. "We will lick our wounds and we'll come out fighting next week. "It's frustrating because we put on such a strong performance last week (a 3-3 draw against Celtic). I'm not going to slaughter the players. They weren't good enough today. "In every aspect of the game, they were far better than us, but we are in there fighting and we will do that until the last game." Motherwell could yet make up the four-point gap on Aberdeen to finish second but could also be caught by United, who trail them by the same margin. The Steelmen host St Johnstone next week then welcome Inverness on Wednesday 7 May and complete the season at Pittodrie. "It will be down to what we do. We have two home games coming up and we finish off up at Aberdeen," continued McCall. "Regardless of today's result, we have got to be at our best next week."